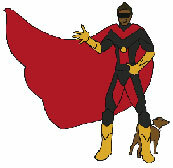 The Adventures of Super Cuz is a community legal education project for primary school children based on a radio program. The radio plays feature a legally oriented superhero called Super Cuz who unexpectedly shows up in sticky situations to give advice to young people who have a legal problem. Each play presents scenarios and gives advice on issues including discrimination, consumer issues, bullying, problems with energy suppliers and dealing with the police. The plays are available on the CD Super Cuz: Adventures of a Koori superhero who fights for justice. Select a track below to listen to Super Cuz radio play (or read the script on screen).